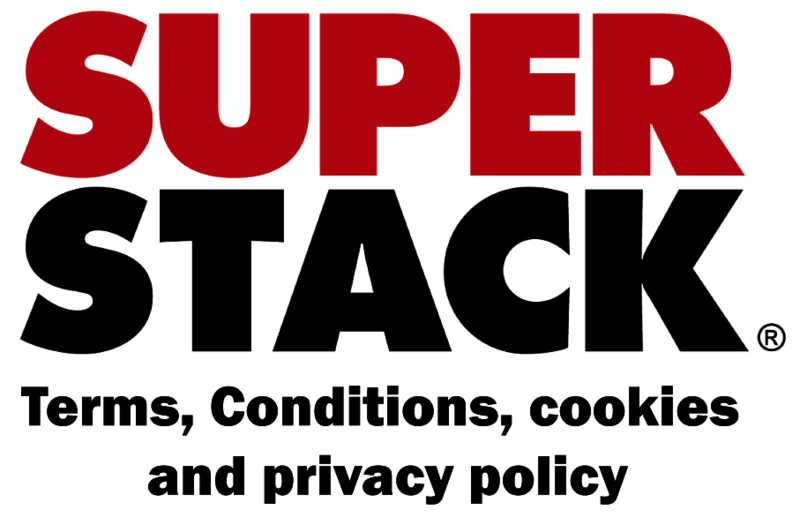 1) Terms and conditions: these terms and conditions apply to every Super Stack® Event without exception and supersede any other written or oral terms. By entering a Super Stack® Event players hereby agree to and accept these terms and conditions in their entirety. 2) Super Stack® Event Operation: the events are held in association with our Casino partners whose tournament regulations, decisions or TDA regulations as they choose govern the operation and organisation of the events.The Casino's Tournament Director's decisions are final and players should direct all questions regarding the running of the Super Stack® to the relevant Casino staff and Management. 3) Amendments to Tournament rules: The Casino partners and Super Stack® reserve the right to add or amend any Tournament or Event rules, structures, dates or details as deemed appropriate. 4) Right to cancel or change Events: Super Stack® and/or the Casino Partners at which the Events are held, reserve the right to cancel or change any Event at our sole and absolute discretion, including dates and structure. Any changes will not incur any liability or consequential losses on the part of Super Stack® or its Casino Partners. Players are therefore strongly advised to ensure that travel arrangements are on a refundable basis and that Event seats have been booked prior to booking any transport or accommodation. A minimum of 20 players are required to start any flight or event and any lower number to start is at Super Stack's sole discretion. Player capacity restrictions may be imposed at any time to ensure the efficient and smooth operation of the events. In the case of excess player numbers an alternate waiting list will be in operation. Super Stack and its Casino Partners reserve the right to add or remove flights to accommodate unexpected player numbers. 5) Rules and Regulations: You agree to abide by the Casino Partners’ house rules and applicable gaming regulations. 6) Right of Refusal of entry: We reserve the right to refuse any person entry into any and all Tournaments as well as the Event area(s) for any reason. Individuals who are excluded by Super Stack®, Casino Partners or venues themselves are not eligible for entry into any Tournaments or Events area(s). 7) Players with Conflict of Interest: Any Employee of a Casino Partner or and their family as defined below are not eligible to play in any Events, unless approved by Super Stack® at our sole discretion. “Family” for these purposes is defined as: spouse, partner, siblings, children and any relative of an employee or other person residing in the employee's place of residence. 8) Prizes, taxes and transfers: Prizes and entries are non-transferable. Winners are responsible for payment of any and all taxes, licenses, registrations and other fees associated with Tournament prizes. Prize pool deductions are detailed on our websites and promotional information sheets (as of May 2018 a 6% prize pool deduction to Organisation for all Elite events and an additional 4% prize pool deduction at Marbella events to the Casino Partner). Payouts will be in either cash, bank transfer or a combination of both depending upon local regulations and Casino's discretion. 9) Disqualification: We, together with the organising casino in which the Event will be held, reserve the right to disqualify any person from all Tournaments and/or to request the removal of such persons the Event area(s) for any reason. If you are disqualified from a Tournament, you shall forfeit your entire buy-in and shall not be entitled to any Tournament prize monies or any other prize consideration that you may have qualified for at the point of disqualification. 11) Force Majeure: We shall not be liable for any delay or failure in performing our obligations or elsewhere including (but not limited to) in the event of acts, events, omissions or accidents beyond our reasonable control including (but not limited to) acts of God, fire, explosion, accidental damage, flood, earthquake, adverse weather conditions or other natural disaster, war, threat of or preparation for war, terrorist attack, civil war, civil commotion or riots and voluntary or mandatory compliance with any law (including a failure to grant any licence or consent needed or any change in the law or interpretation of the law). 12) Amendments: We reserve the right to change the terms and conditions herein at any time; therefore, you should review the most updated version each time prior to your participation in any Tournament. 13) Limitation of liability: Players agree that other than as required by applicable law, we shall not be liable to them for any losses, damages, claims or other expenses arising from a player's participation in the Events, date, time or venue amendments or for any player not being able to attend any event, whether by transport delays, visa problems or other reasons. It is the player's responsibility to make their own arrangements for attending the events. 14) Guarantees provided by Casino Partners are dependent upon a minimum of number of players to start and are the sole responsibility of the Casinos. 15) Tournament completion: Tournaments will come to an end when either a winner has been declared or time has run out at the Venue. 45 minutes before the Venue's finishing time, players will be advised of the last 30 minutes of play. At the end of the 30 minute period, the last three hands will be announced, after which any remaining players will split the remaining prize pool corresponding to their chip stacks using an ICM calculator. Players will then be forced all in to determine the winning order and overall winner of the event and trophy. If any deal is agreed, players will still be required to go all in to determine tournament placings and overall winner as described herein. The final may be postponed until the next day at the sole discretion and agreement of the Casino. 16) Players may play multiple day 1's and choose which stack to go through to day 2 with. (i) use any film, photographs and sound recordings in which you feature at the Super Stack® Tournaments. (ii) use any photograph, film or sound recording involving you at the Super Stack® Tournaments for marketing purposes or any performance by you of the same, which may be included in the advertisement in any media by any means now known or invented in future throughout the world for the full period of copyright, including all renewals, revivals, reversions and extensions. (iii) correspond with you at your email address regarding the Super Stack® Tournaments and any third party related events, insofar as you agree to be entered into the Super Stack® mailing list, which is possible to unsubscribe from. (iv) irrevocably and unconditionally grant to the owners and organisers of the Super Stack® Tournaments any consent required pursuant to this agreement to use any content with footage of you from the Super Stack® Tournaments. (v) irrevocably and unconditionally waive all rights which you may have in respect of the content specified throughout this section. (vi) consent to the use by the owners and organisers of the Super Stack® Tournaments of your name, likeness, voice and biography in connection only with the content created from the Super Stack® Tournaments. (vii) assign or license the media release to any third party. (viii) agree for your name or alias to be used in detailing prize wins, along with photographic or video footage of your Tournament result. (ix) agree to be photographed for final table and winner positions, in line with the conditions contained herein. A cookie is a small file which asks permission to be placed on your computer's hard drive. Once you agree, the file is added and the cookie helps analyse web traffic or lets you know when you visit a particular site. Cookies allow web applications to respond to you as an individual. The web application can tailor its operations to your needs, likes and dislikes by gathering and remembering information about your preferences. We use traffic log cookies to identify which pages are being used. This helps us analyse data about webpage traffic and improve our website in order to tailor it to customer needs. We only use this information for statistical analysis purposes and then the data is removed from the system.Overall, cookies help us provide you with a better website by enabling us to monitor which pages you find useful and which you do not. A cookie in no way gives us access to your computer or any information about you, other than the data you choose to share with us.You can choose to accept or decline cookies. Most web browsers automatically accept cookies, but you can usually modify your browser setting to decline cookies if you prefer. This may prevent you from taking full advantage of the website. Links to other websites - Our website may contain links to other websites of interest. However, once you have used these links to leave our site, you should note that we do not have any control over that other website. Therefore, we cannot be responsible for the protection and privacy of any information which you provide whilst visiting such sites and such sites are not governed by this privacy statement. You should exercise caution and look at the privacy statement applicable to the website in question. Controlling your personal information - We will not sell, distribute or lease your personal information to third parties unless we have your permission or are required by law to do so. We may use your personal information to send you promotional information about third parties which we think you may find interesting. You may request details of personal information which we hold about you. A small fee will be payable. If you would like a copy of the information held on you please write to us. If you believe that any information we are holding on you is incorrect or incomplete, please write to or email us as soon as possible. We will promptly correct any information found to be incorrect. What we collect by form completion - We may collect the following information: name, contact information including email address, demographic information such as postcode, preferences and interests, other information relevant to gaming. What we do with the information we gather - We require this information to understand your needs and provide you with a better service, and in particular for the following reasons: Internal record keeping; We may use the information to improve our services; We may periodically send promotional emails about new products, special offers or other information which we think you may find interesting using the email address which you have provided. ; From time to time, we may also use your information to contact you for market research purposes. We may contact you by email, phone, fax or mail; We may use the information to customise the website according to your interests. Security - We are committed to ensuring that your information is secure. In order to prevent unauthorised access or disclosure, we have put in place suitable physical, electronic and managerial procedures to safeguard and secure the information we collect.